My grandpa Lee Quinn always made a corn casserole for our Thanksgiving feast, and it’s a dish we continue to make in our family. One of the joys of food is that it can symbolize memories, and corn casserole will always remind me of my grandpa. The beautiful thing about corn casserole is that it jazzes up a side dish (plain whole kernel or cream corn) that otherwise lacks excitement. When a meal includes turkey, stuffing, macaroni and cheese, green bean casserole and a variety of pies, how can you get excited about little yellow kernels of corn? When corn comes in a casserole, it feels more festive and, truth be told, all of that cheese, cream and butter just make it taste better. 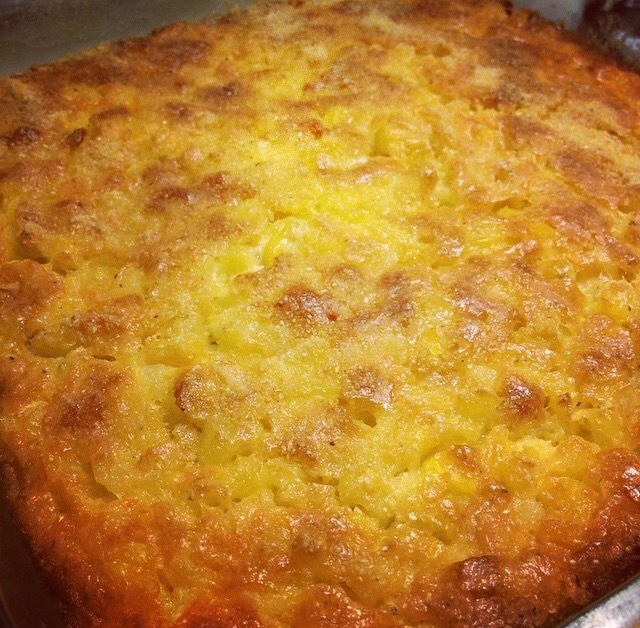 Here’s the recipe for our corn casserole. Thanks, grandpa, and Happy Thanksgiving! Mix all of your ingredients and pour into a greased casserole dish. Bake at 350 degrees for 30 minutes or until golden brown on top. Previous Foodie Travels: Burger Bar, Bristol, Va.
Next Foodie Travels: Ronda’s Kitchen, Grover, N.C.